We last looked at both No More Heroes 2(NMH2) and Tatsunoko vs. Capcom(TvC), when they debuted on the Nintendo Channel after their releases. As the image above shows, TvC debuted 3-weeks faster than NMH2 did, though they were both released on January 26, 2010. 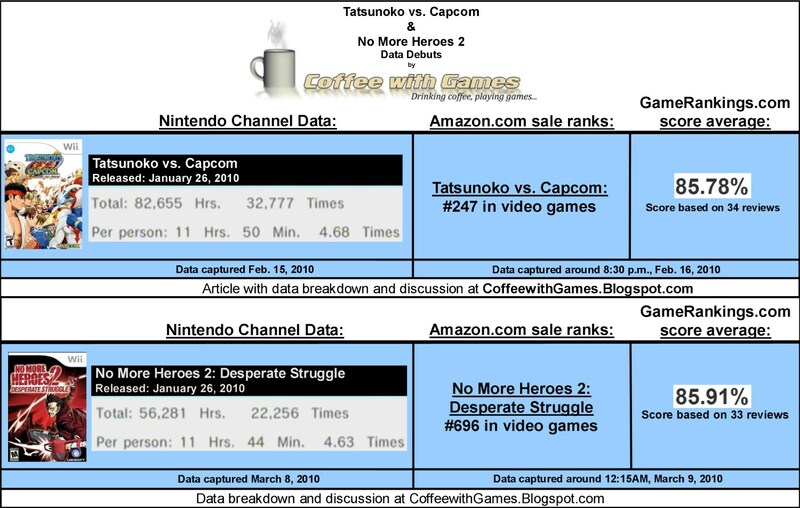 It has been about 7-weeks since I showed the data for No More Heroes 2, and 10-weeks for Tatsunoko vs. Capcom. How have both games been performing since their debuts? Let's take a look! No More Heroes 2 debuted with 4,806 players reporting data, NMH2 now has 8,153 players reporting their play-time data. Tatsunoko vs. Capcom debuted with 7,003 players reporting data, TvC now has 21,200 players reporting their play-time data now. No More Heroes 2 has added 3,347 more players, reporting data since it debuted on March 8, 2010. Tatsunoko vs. Capcom has added 14,197 more players, reporting data since it debuted on February 15, 2010. No More Heroes 2 has 101,594 Total Hours reported, an increase of 45,313 hours since it debuted. Tatsunoko vs. Capcom has 361,266 Total Hours reported, an increase of 278,611 hours since it debuted. No More Heroes 2 's Amazon.com sale rank is #1,247 and the current selling price is $43.23. Tatsunoko vs. Capcom 's Amazon.com sale rank is #947 and the current selling price is $46.99. No More Heroes 2's review score average is 84.33%, based on 39 reviews. Tatsunoko vs. Capcom's review score average is 85.65%, based on 39 reviews. I still have not played either No More Heroes 2 or Tatsunoko vs. Capcom. 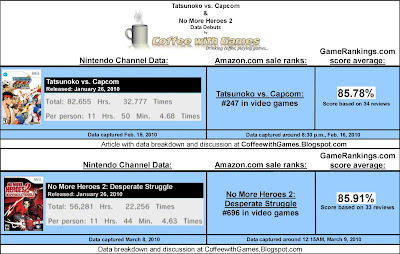 I think the data shows that Tatsunoko vs. Capcom's online play(I think), has helped it to steadily increase since it debuted, in the average hours "Per person" reported. No More Heroes 2 seems to be sitting pretty close to the number of hours, "Per person" that was originally reported with its debut. If you have played them, do you find yourself still playing the games, or did you play them for a while and have since stopped? The numbers indicate that TvC has sold now almost 3 times the number of copies as NMH2. I have only played NMH2 and it tooke me about 12 or 13 hours. That tells me that most players are completing the game and that is it (a few may replay it, and a few probably don't finish). TvC's online play drives a higher average, but also might help it's word of mouth. So a player who really likes it talks is friends into buying it so they can play online (but keeps his own copy). I think NMH2 has strong eBay sales for people looking to sell their used copy, or wanting to pick it up but only for $30 not the $50 at retail. I think NMH2 is doing about what I expected. I'm one of those people who beat it on each difficulty, so I dropped about 60 hours into it. 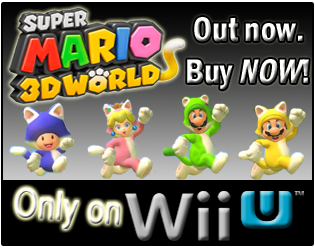 Its kind of a niche game still, despite being more mainstream accessible than its predecessor. I still have a few Death Match fights to go back and work on down the road, its definitely a game I'll keep and spend more time with. TvC is a game I can see having continued success. I think that this is thanks to the online fighter aspect which probably has two effects. The obvious being, online multiplayer keeps the game fresh with continually evolving opponents. (Looking at my 300+ hours with Brawl for reference.) The other factor is, being an online game, there's a better chance of its players being connected and using the Nintendo Channel to log data. So, has Capcom figured out how to sell well on the Wii? I wonder if Monster Hunter and TvC are any indication. I bought TvC. I bought it because my friend and I really enjoy those MVC2 type kind of games. We played a total of 2 hours online one night and we both haven't played each other since. I sold it on ebay for $36.01. Moral of the story: Don't let friends build up a game to be awesome if you know you won't play it after a month. "TvC's online play drives a higher average, but also might help it's word of mouth." I think Nicodemus at Nite's comment shows that word of mouth did help at least one sale of TvC. I wonder how many others are like Nicodemus at Nite though, that purchased the game and didn't play it much, only to sell it or trade it in. "The other factor is, being an online game, there's a better chance of its players being connected and using the Nintendo Channel to log data." Yea, I agree that if a game has an online function, the players that play it are probably more likely to use the Nintendo Channel and have data reported. I wonder how the NPD numbers for each game would look now. "So, has Capcom figured out how to sell well on the Wii? I wonder if Monster Hunter and TvC are any indication." I hope these games are an indication, of future games from Capcom on the Wii. 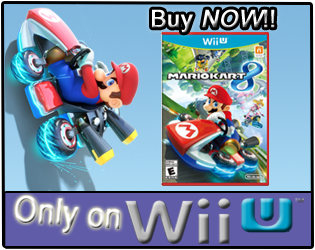 Now, you can use that $36.01 and purchase Monster Hunter 3! Hopefully though, it won't end up with little play-time like TvC did! Thank you all for the comments/thoughs/experiences!